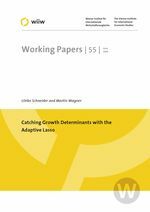 This paper uses the adaptive Lasso estimator to determine the variables important for economic growth. The adaptive Lasso estimator is a computationally very simple procedure that can perform at the same time model selection and consistent parameter estimation. The methodology is applied to three data sets, the data used in Sala-i-Martin et al. (2004), in Fernandez et al. (2001) and a data set for the regions in the European Union. The results for the former two data sets are similar in several respects to those found in the published papers, yet are obtained at a negligible fraction of computational cost. Furthermore, the results for the European regional data highlight the importance of human capital for economic growth.